Using either a spiral slicer or a veggie peeler, create pasta with the beets. Sprinkle the pasta with some salt and massage it into the beets. Let the pasta sit in a colander while you create the sauce. It will become softer, like an al dente pasta. In a food processor, mix together all sauce ingredients. Place pasta onto individual serving plates, top with sauce and parsley. Enjoy! This will create two extremely large plates of pasta, or you can easily serve four nice-sized servings with a large salad and be satisfied. If you try this, please let me know. I loved it!!! Wendi I have only been signed up to receive your blog for a few days and I have truly enjoyed reading your comments on your mono meals. You have such a gift in writing to where people can truly feel your heart. I live in the North Hills and found out about your website when I received the co-op flier this month. I am not on a raw food diet yet. I need to be and I want to be and I am hoping to get inspiration from your site to help me. I have loved reading your comments and your story and your families stories are all awesome. 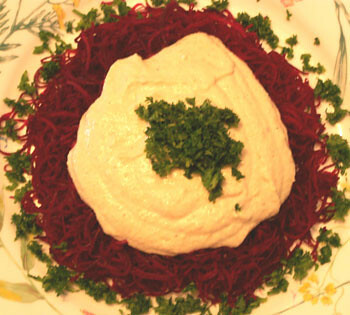 Your pictures are wonderful, this beet pasta looks so good and I want to try it someday. Can you reccomend something for me to read to help me get started. Keep up the great work, I love reading your info. Thanks for the comment, Yardsnacker! I hope you do try the beet pasta. I LOVE it!! Some people do carrots, as well (have you tried that, before ). I prefer the beets over zucchini, actually! Yum! I smiled when you wrote that people can truly feel my heart. The thing I love more than anything else in the world is to spread love to others, so hearing that people can feel my heart through my writing makes my spirit soar! I live in the South Hills. Are you signed up for the Pittsburgh raw food potluck meetup? I wrote about it in one of the Take the Time Tuesday blog entries. Congratulations for making the decision to eat raw foods! Your life is about to change in the most amazing ways once you begin your journey!! If you have any questions, don't hesitate to ask. I love helping people. Did you read about the retreat at the end of May? It might be a great way for you to learn a lot about raw foods, as well as sample a lot of different raw foods! Other than the Raw Foods 101 here on our PureJeevan.com site, we have a link for resources. In those resources are books that are helpful for raw foodists. My favorite is Matt Amsden's Rawvolution for tasty raw meals. I giggled when I read that you were going to try serving beet pasta to BBQ boy! LOL If you really do try it with him, I want to hear what he thinks! For my husband, he enjoyed eating the raw foods in the beginning when I was making more complex raw meals that tasted similar to cooked foods. Now, sometimes I think he is eating healthier than I am! ;-) We don't eat a lot of complex foods anymore, like we did in the beginning of going raw.